Fresh-cut fruits are popular due to the convenience provided. However, fresh-cut processes damage fruit tissues and reduce the shelf life of products. Pulsed light (PL) treatment is a decontamination method of foods. PL treatment given repetitively at a certain interval during storage could further extend the shelf life of fresh-cut fruits. Edible coating preserves fresh-cut fruits by providing mechanical strength and reducing respiration and water loss. This study was to evaluate the effects of alginate coating combined with repetitive pulsed light (RPL) on sensory quality and flavour of fresh-cut cantaloupes during storage. Cantaloupes were treated with alginate (1.86%, w/v) and RPL (0.9 J/cm2 at every 48 h up to 26 days) alone or in combination. Flavour analysis of fresh-cut cantaloupes was carried out every 12 days during storage at 4 ± 1 °C while sensory analysis was performed on day 32. 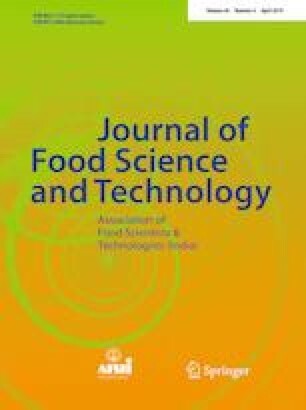 Alginate coating and/or RPL retained sugar contents (17.92–20.01 g/kg FW for fructose, 18.77–19.98 g/kg FW for glucose and 23.02–29.41 g/kg FW for sucrose) in fresh-cut cantaloupes during storage. Combination of alginate with RPL reduced accumulation of lactic acid although alginate coating was more effective to minimise changes of other organic acids in fresh-cut cantaloupes. The combined treatment was also more effective than individual treatment in retaining total aroma compound concentration of fresh-cut cantaloupes during storage with the highest relative concentration, i.e. 3.174 on day 36. Overall, the combined alginate coating and RPL was effective to maintain the fresh-like sensory quality of fresh-cut cantaloupes with insignificant overall acceptability compared to the control. The authors are grateful to Universiti Putra Malaysia for supporting this study through Project GP-IPS/2015/9469100.